Location: Hotel "Dobrudja" is situated in the center of the complex "Albena", just 300 m. away from the shore and it is at the beginning of the Art street. The hotel is 16 floor building with 6 lifts. 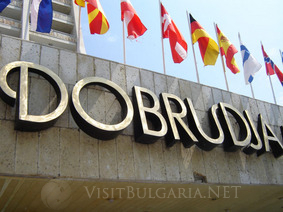 The "Dobrudja" hotel is a symbol of Albena and it is well known as a hotel with high standards of service and friendly staff. The hotel is perfect for family holidays, as well as business trips. •	Double rooms – The hotel offers 170 double rooms, all are with bath with bath tube, phone, cable TV, mini bar. 79 rooms are with balcony, 62 with local air condition, 42 rooms with central air condition. 8 rooms and 2 studios are renovated. •	Big apartments – 31 air conditioned big apartments with 4 beds - 1 livinfg room and 2 bedrooms All rooms are equipped with phone, cable TV,mini bar. •	There are two rooms for people with disabilities on the first floor. Restaurants and bars: The main restaurant is in the lobby area. The main hall is for non-smokers, air conditioned, offers international meals and a-la-carte service. - Restaurant "Blue Sky" is on the 17th floor. Offers unique dishes, French kitchen. Next to the restaurant there is a big terrace, which is opened during the summer. - Panorama Cafй – on the 15th floor with a wonderful view over "Albena" and Black sea, offers variety of cocktails, alcohol, soft drinks and sweets. - Restaurant "The green apple" - the guests will have the possibility to taste healthy meals in a pleasant atmosphere. Part of the team of the restaurant will be one of the most famous specialists on the field of the healthy food in France and cook Mr. Jean Montagart. Sport and leisure: "Albena" offers different opportunity – stadiums, riding club, tennis, table tennis, water sports, mini golf. Guests of the hotel can use indoor and outdoor swimming pool with average temperature 31 degrees Celsius as well as the fitness center. Spa and Wellness: The unique balneology center "Medica" is situated in the Dobrudja hotel, which is the only one of its kind within the whole Bulgarian seaside with his new equipment and recreation therapy. The center offers different Wellness and beauty programs, cosmetic studios. Entertainment: Albena resort offers a wide range of possibilities to have a good time in the resort. You can visit Variety -theatre "Albena". The Guest can hire a bicycle or make a romantic beach tour riding a horse, or try national or foreign meals in our cosy restaurants. Business facilities: The congress center of Albena is situated in the hotel with two conference halls with 250 and 30 seats respectively - "Atlantik" and "Pasific" halls. In the rooms, lobby area, restaurant one can use WIFI access to internet.